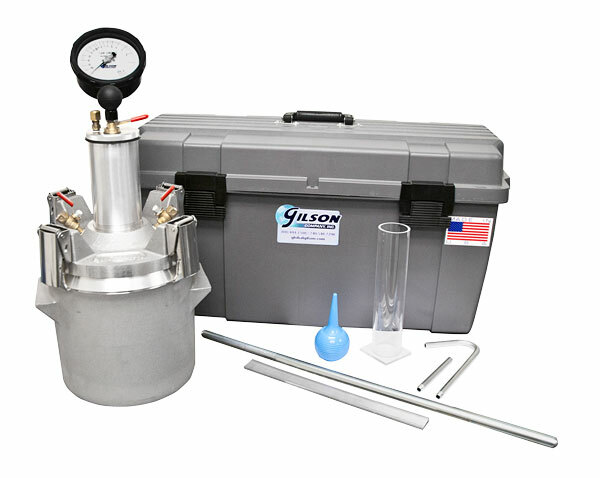 Gilson's high-quality HM-30 Pressure Meter for concrete air content determination has many improvements that make it an excellent buy. Long lasting stainless steel clamps adjust quickly and are much less expensive to replace. Larger gauge in stainless steel housing is easier to read and calibrate and sealed to reduce need for maintenance. Pump with large, easy-grip handle builds pressure quickly with longer strokes and is shielded to keep dirt and water out of the piston area. Brass petcocks have stainless steel ball valves for accuracy and durability. Petcock handles are vinyl coated for more comfortable operation. The dimensions and accuracy of these new units exceeds ASTM requirements. syringe for water and operating instructions. The cast aluminum chamber is 0.25 cu. ft. and may also be used for unit weight and yield determinations. The sturdy plastic transport case securely holds the meter and all the accessories in die-cut foam padding. The case has plenty of extra room for other gear such as scoops and thermometers.